A lot of people have asked what happened to the March USS park update. The reason there wasn’t one? I had no time to visit the resort for the past few weeks and there was a lot of coverage over Sesame Street in early March. But anyway, since there were requests, I’ve decided to compile some small changes that happened in the past few weeks, such as the new Annual Passes. Yes, they made some changes again. 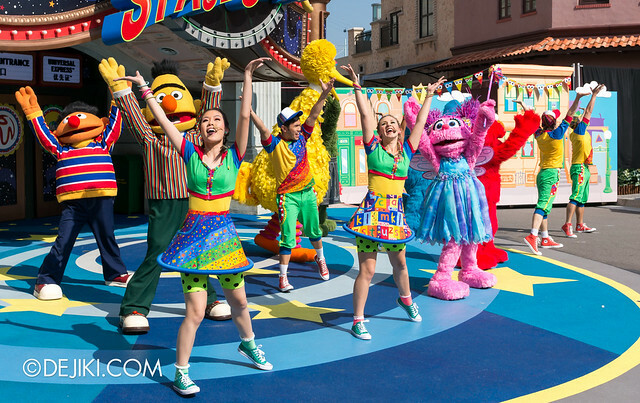 Let’s review the new Sesame Street attraction and events at Universal Studios Singapore! 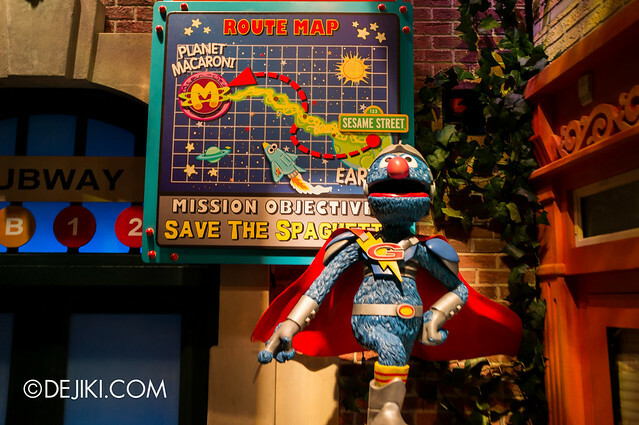 Why not start with an in-depth tour of Sesame Street Spaghetti Space Chase? Sesame Street Spaghetti Space Chase, the park’s new family attraction, launched on 1st March 2013. There was some major fanfare during its grand opening, including a three-day carnival. 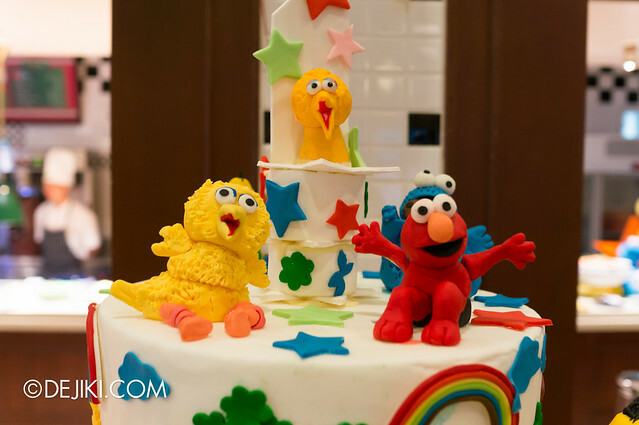 Lastly, check out photos from the Sesame Street Character Breakfast experience. With the soft launch of RWS Attractions Pass, the Annual Pass cards for Universal Studios Singapore have changed again. RWS Attractions Pass consolidates Annual Passes for Resorts World Sentosa’s parks: Universal Studios Singapore, Adventure Cove Waterpark and S.E.A. Aquarium. At the moment, the Annual Pass for S.E.A. Aquarium (in any format, including as an option of RWS Attraction Pass) is not available. For Annual Passholders who are only interested in Universal Studios Singapore, this is just a drastic design change. There are no changes to park benefits since last November. At first I thought this “Attractions Pass” is only for guests who choose to buy a multi-park annual pass, but it has been confirmed that the resort will only issue one card design for any combination of Annual Passes, including single-park Annual Passes. The iconic Universal Globe Annual Passes are hence discontinued. I think the multi-park programme makes perfect sense for people who love revisiting parks at RWS, but I am not feeling this card design. It just looks so… undesirable compared to the card designs for 2011, and the artwork has already been used for other promotions (RWS Grand Opening I believe). Surely the marketing team could’ve thought of something better, or engaged me for design services (haha). I guess this design change will help to sell themed lanyard card cases from the parks – you know, the cool ones Transformers Supply Vault, or those cute Sesame Street designs – to give USS Annual Passholders some identity. An illustration featuring Dolphins, Roller coaster tracks, Hotel Michael and Crane Dance. Fun Pass has the illustration fully coloured, while Superstar Pass has the illustration in greyscale, with a red stripe at the bottom. The Superstar Pass also has a soft glittery finish. Universal Studios Singapore logo with three different backgrounds: Blue, Silver and Gold. The name of each Annual Pass is printed with matching metallic foil at the front. All three cards’ front sides have a shimmery finish to match the starry background. Similar to #2, but only one card design with a dark blue background. The front reads “Annual Pass”, and the reverse side now incorporates a full-colour photograph of the Annual Passholder, as well as the membership expiry date and Universal Express access logo (if add-on is purchased). Montage of the three major attractions in Resorts World Sentosa: Universal Studios Singapore, Adventure Cove Waterpark and S.E.A. Aquarium. Single card design for any combination of attractions. On the bright side, the RWS Attractions Pass offers savings up to 15% as compared to buying separate annual passes. For an adult, the price for Universal Studios Singapore and one attraction of Marine Life Park (Adventure Cove Waterpark OR S.E.A. Aquarium) is $240. For access to all three parks, it will be $320. RWS Attractions Pass is also available as a Single Park option for either Universal Studios Singapore or Adventure Cove Waterpark. Refer to this guide for latest information on USS annual passes. The Annual Pass for S.E.A. Aquarium (in any format) is no longer offered. 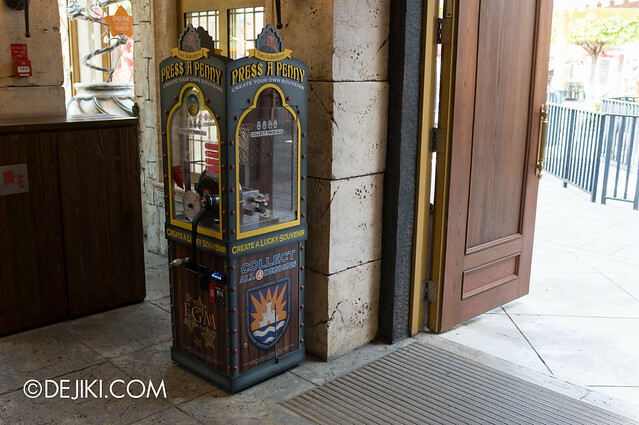 More Press-A-Penny machines have turned up at the Resort, which means that it’s about time for the Press-A-Penny guide. There are now 5 unique machines in Universal Studios Singapore (2 more at Marine Life Park). Stay tuned for a guide to all the machines as well as pressed coins souvenir! That’s all for now! I hope that there’ll be some exciting changes in the parks for me to write about. Dejiki can I check if I already bought the USS annual pass is there any way to upgrade to a two attractions annual pass? Even withy he USS express? I don’t have confirmed info about upgrades as of now. Renewal wise, existing USS Annual Passholders cannot renew to a Multi-Park pass, they have to buy a new Attractions Pass. Annual Pass with Express is available for any combination of RWS Attractions Pass with USS as one of the parks: it’s a $100 top-up. More info will be available when the programme is officially launched. 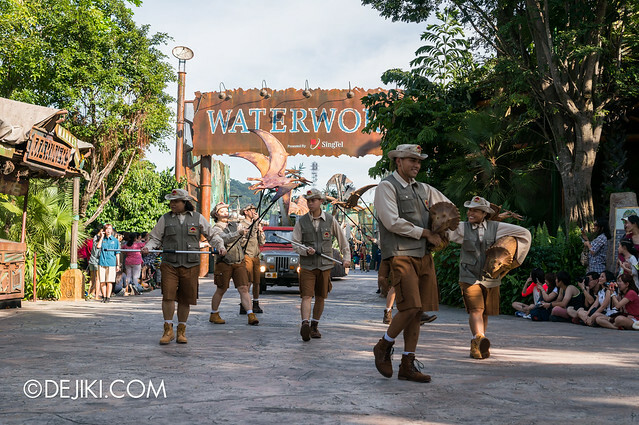 Apart from sesame street , do you know of any new upcoming rides or attractions? The park is developing a new attraction which is expected to be ready in 2015. I was just wondering if you have any information on the SEA Aquarium Annual Passes? Just asking since you seem so knowledgeable about RWS. SEA Aquarium Annual Pass is no longer offered on its own. You will be able to get unlimited annual access to the Aquarium with the RWS Attractions Pass (Multi-Park; bundled with another RWS park). Could you perhaps link me to the RWS Page for the Pass? Tried searching for it just now, but failed. There is no page available as the RWS Attractions Pass programme is not officially launched yet. Do call RWS or visit the resort’s parks for more information. You may also sign up for the Pass at the resort. I’m not too sure what they mean by this. Is this for the previous annual pass scheme, or is this applicable to the new scheme as well? Very sorry for the late reply, but I’ve confirmed with the park about the RWS Attractions Pass. At the moment, it is not possible to purchase a Multi or Single Park Pass for S.E.A. Aquarium. It appears that they have oversold passes to the Aquarium (both day and annual passes) and the entire facility is unable to cope with tremendous influx of guests. The Press A Penny post is finally ready! Click here to view it!